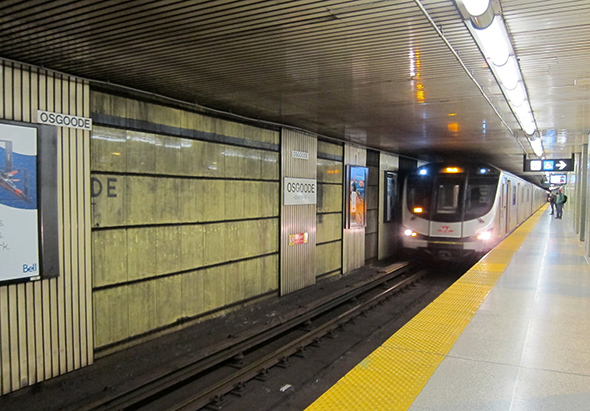 The TTC's Osgoode subway station is the latest on the University side of Line 1 to be treated to a full panelling makeover. That's a good thing too, as it was probably the ugliest station in the lower loop of the system. Most of the mucus-toned plastic panels have been removed to reveal the original Vitrolite tiles, which are similar in colour but far prettier even if they're covered in years upon years of soot build-up. 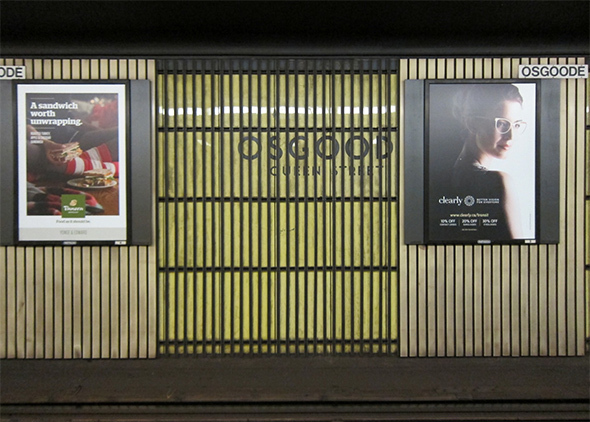 The vertical panels at Osgoode always seemed like the TTC mailed it in when they gave up on maintaining the delicate Vitrolite tiles. 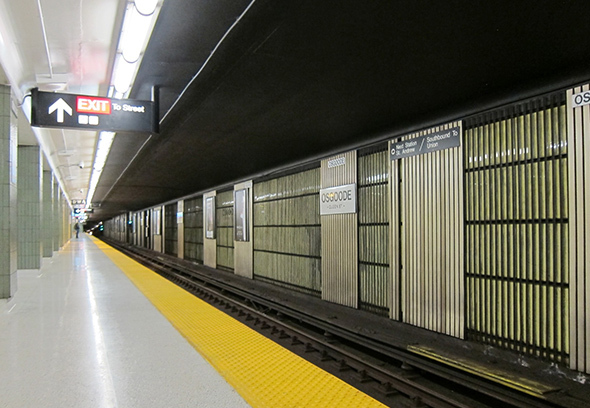 Soon the station will boast the new metal panels that have also been installed at St. Andrew Station. These have the feel of the original tiles, but are far more durable. The main colour stays (mostly) the same, while the trim has now been darkened from the original light blue. While not perhaps quite as interesting as the dichotomy between old and new at College Station, it's worth looking up from your newspaper/phone/e-reader when you next pass by Osgoode to see the station in this strange moment of transition. It will soon look far cleaner, but don't expect to get another glimpse at the original tiles for another 50 years or so.